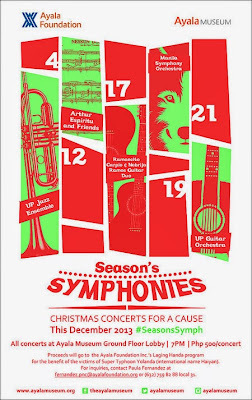 The schedule of performances are as follows UP Jazz Ensemble: Have A Swingin' Christmas onDecember 4 Arthur Espiritu and Friends: A Christmas Offering on December 12; Ramoncito Carpio and Nebrija Ramos Guitar Duo on December 17 Manila Symphony Orchestra performs Peter and the Wolf by Sergei Prokofiev on December 19; and UP Guitar Orchestra on December 21. 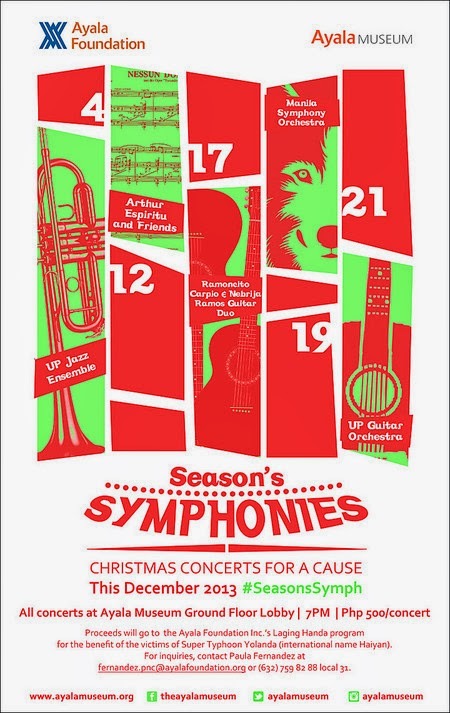 All concerts will begin at 7:00 pm and will be held at the Ayala Museum Ground Floor Lobby. Tickets are available for Php 500 each, valid ONCE for any of the five concerts. For more details, please call Paula Fernandez at (63 2) 759-8288 local 31 or email fernandez.pnc@ayalafoundation.org.